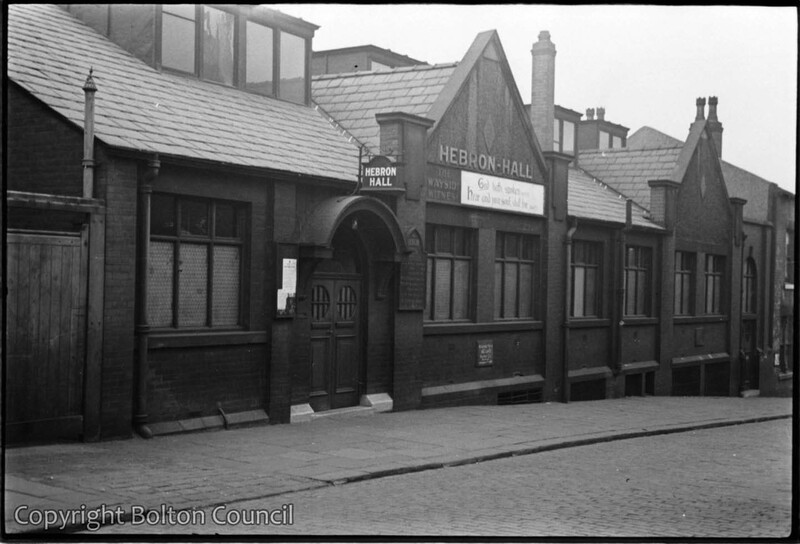 Hebron Hall on Mayor St, Bolton. The hall is still in use today (2012). Mass Observation planned to publish a study of religious life in Bolton to follow on from John Sommerfield’s The Pub and the People. It was planned that Humphrey Spender’s photographs would be used to illustrate this survey, as they had been in Sommerfield’s book, and so many of the Worktown photographs are of religious buildings and services. The start of the Second World War interrupted the plans for the book which was then never completed. Hebron Hall according to my the late Aunt Jane Baldwin played a central part in the community around the lower part of Deane Road/Derby Street during the last century. Poverty was common and religious organisations including Hebron Hall played a roll in offering pastoral and practical succour to the community. My family history is that Joseph or Charles Stopforth were instrumental in the development of Hebron Hall in Bolton. I cannot find supporting evidence of this involvement. Any firm (written/photographs) or anecdotal information would be most welcome.